This specification describes the syntax and semantics of XProc: An XML Pipeline Language, a language for describing operations to be performed on XML documents. An XML Pipeline specifies a sequence of operations to be performed on one or more XML documents, producing one or more XML documents as output. Steps in the pipeline may read or write non-XML resources as well. This document was produced by the XML Processing Model Working Group which is part of the XML Activity. Publication as a Working Draft does not imply endorsement by the W3C Membership. This is a draft document and may be updated, replaced or obsoleted by other documents at any time. It is inappropriate to cite this document as other than work in progress. This is a first public Working Draft, based on the previously published Requirements Document. Although not all the details of the design are complete, the Working Group has chosen early publication in order to show the direction we are heading and to encourage feedback from potential users. Please send comments about this document to public-xml-processing-model-comments@w3.org (public archives are available). An XML Pipeline specifies a sequence of operations to be performed on a collection of input documents. Pipelines take zero or more XML documents as their input and produce zero or more XML documents as their output. Steps in the pipeline may read or write non-XML resources as well. A pipeline consists of components. Like pipelines, components take zero or more XML documents as their input and produce zero or more XML documents as their output. The inputs to a component come from the web, from the pipeline document, from the inputs to the pipeline itself, or from the outputs of other components in the pipeline. The outputs from a component are consumed by other components, are outputs of the pipeline as a whole, or are discarded. There are two kinds of components: steps and (language) constructs. Steps carry out single operations and have no substructure as far as the pipeline is concerned, whereas constructs can include components within themselves. This specification defines a standard library, Appendix D, Standard Component Library, of steps. Pipeline implementations may support additional steps as well. 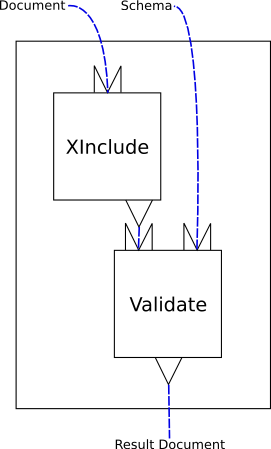 Figure 1, “A simple, linear XInclude/Validate pipeline” is a graphical representation of a simple pipeline that performs XInclude processing and validation on a document. This is a pipeline that consists of two steps, XInclude and Validate. The pipeline itself has two inputs, “Document” and “Schema”. How these inputs are connected to XML documents outside the pipeline is implementation-defined. The XInclude step reads the pipeline input “Document” and produces a result document. The Validate step reads the pipeline input “Schema” and the output from the XInclude step and produces a result document. The result of the validation is the result of the pipeline, “Result Document”. How pipeline outputs are connected to XML documents outside the pipeline is implementation-defined. 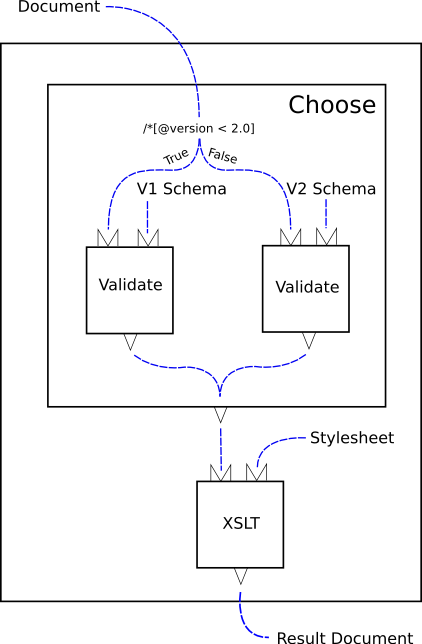 Figure 2, “A validate and transform pipeline” is a more complex example: it performs schema validation with an appropriate schema and then styles the validated document. The heart of this example is the conditional construct. The “choose” construct evaluates an XPath expression over a test document. Based on the result of that expression, one or another branch is evaluated. In this example, each branch consists of a single validate component. [Definition: A pipeline is an acyclic, directed graph of components connected together by inputs and outputs.] In other words, it's a set of components connected together with outputs flowing into inputs without any loops (no component can read its own output, directly or indirectly). A pipeline is itself a construct and must satisfy the constraints on constructs. The result of evaluating a pipeline is the result of evaluating the components that it contains, in the order determined by the flow graph that connects them. A pipeline must behave as if it evaluated each component each time it occurs in the flow graph. Unless otherwise indicated, implementations must not assume that components are functional (that is, that their outputs depend only on their explicit inputs and parameters) or side-effect free. Steps are the basic computational units of a pipeline. [Definition: A step is an atomic unit of XML processing, such as XInclude or transformation.] Steps can perform arbitrary amounts of computation but they are indivisible from the point of view of the construct that contains them. Steps carry out fundamental XML operations. An XSLT step, for example, performs XSLT processing; a validation step validates one input with respect to some schema, etc. Language constructs, on the other hand, control and organize the flow of documents through a pipeline, reconstructing familiar programming language functionality such as conditionals, iterators and exception handling. As such, they typically contain components, whose evaluation they control. Components have any number of parameters, all with unique names. A component can have zero parameters. Although some kinds of components can read and write non-XML resources, what flows between components as inputs and outputs are exclusively XML documents or sequences of XML documents. Each XML document (or document in a sequence) must be a well formed [XML 1.0] or [XML 1.1] document. Is support for XML 1.1 optional? The inputs and outputs can be implemented as sequences of characters, events, or object models, or any other representation the implementation chooses. It's inconsistent to point to the XML Recommendation on the one hand, and on the other hand to specify that the representation doesn't have to be a sequence of characters. Fix this, probably by referring to the Infoset and describing XML 1.0/1.1 in some other way. It is a dynamic error if a non-XML resource is produced on a component output or arrives on a component input. What about the cases where it's impractical to test for this error? An implementation may make it possible for a component to produce non-XML output—for example, writing a PDF document—but that output cannot flow through the pipeline. Similarly, one can imagine a component that takes no pipeline inputs, reads a non-XML file from a URI, and produces an XML output. But the non-XML file cannot be an input to a component or pipeline. All of the input ports of a component must be connected to inputs. It is a static error if a component has an input port which is not connected. Unconnected output ports are allowed; any documents produced on those ports are simply discarded. [Definition: The signature of a component is the set of inputs, outputs, and parameters that it is declared to accept.] Each type of step (e.g. XSLT, XInclude) has a fixed signature, declared globally or built-in, which all its instances share, whereas each instance of a construct has its own signature declared locally. [Definition: A component matches its signature if and only if it specifies an input for each declared input and it specifies no inputs that are not declared; it specifies no outputs that are not declared; it specifies a parameter for each parameter that is declared to be required; and it specifies no parameters that are not declared.] In other words, every input and required parameter must be specified and only inputs, outputs, and parameters that are declared may be specified. Outputs and optional parameters do not have to be specified. Each input and output is declared to accept or produce either a single document or a sequence of documents. It is not a static error to connect a port of a component which is declared to produce a sequence of documents to a port that accepts only a single document. It is, however, a dynamic error if the former component actually produces more than a single document at run time. Steps may also produce error, warning, and informative messages. These messages appear on a special “error output” that is available in the catch clause of a try/catch. [Definition: A parameter is a QName/value pair.] The value of a parameter must be a string. If a document, node, or other value is given, its (XPath 1.0) string value is computed and that string is used. Consider two components in such a graph, “component A” and “component B”. It is a static error if a component is either before or after itself. In other words, every flow graph must be acyclic. This section describes the core language constructs of XProc. A pipeline encapsulates the behavior of a subpipeline. It has a number of declared input and output ports and parameters. Viewed from the outside, it is a black box which performs some calculation on the inputs and produces the outputs. From the pipeline author's perspective, the computation performed by the pipeline is described in terms of contained components which read the pipeline's inputs and produce the pipeline's outputs. For example, a pipeline might accept a document and a stylesheet as input; perform XInclude, validation, and transformation over its inputs; and produce a sequence of formatted documents as its output. There is one additional constraint imposed on pipelines: a pipeline must not itself be a contained component. A for-each construct processes a sequence of documents, applying its subpipeline to each document in turn. The for-each construct can be used in cases where a component requires a single document input but a pipeline needs to process a sequence of documents with that component. The result of the for-each is a sequence of documents produced by processing each individual document in the input sequence. If the subpipeline is connected to one or more output ports on the for-each, what appears on each of those ports is the sequence of documents produced by each iteration of the loop. For example, a for-each might accept a sequence of DocBook chapters as its input, process each chapter in turn with XSLT, and produce a sequence of formatted chapters as its output. A viewport construct processes a single document, applying its subpipeline to one or more subsections of the document. The result of the viewport is a copy of the original document with the selected subsections replaced by the results of applying the subpipeline to them. For example, a viewport might accept an XHTML document as its input, apply encryption to selected div elements within that document, and return an XHTML document that is the same as the original except that each selected div has been replaced by its encrypted result. A choose construct selects exactly one of a list of alternative subpipelines based on the evaluation of XPath expressions. The list of alternative subpipelines consists of zero or more subpipelines, each guarded by an XPath expression and a context document, followed optionally by a single default subpipeline. The choose considers each subpipeline in turn and selects the first (and only the first) subpipeline for which the guard expression evaluates to true in the context of its context document. If there are no subpipelines for which the expression evaluates to true, the default subpipeline, if it was specified, is selected. After a subpipeline is selected, it is evaluated as if only it had been present. The result of the choose is the result of the selected subpipeline. For example, a choose might test a schema and apply XML Schema validation to an input document if the schema is an XML Schema document, apply RELAX NG validation if the schema is a RELAX NG grammar, or perform no validation otherwise. In order to ensure that the result of the choose is consistent irrespective of the subpipeline chosen, each subpipeline must declare the same number of outputs with the same names. It is a static error if two subpipeline in a choose declare different outputs. It is a dynamic error if no subpipeline is selected by the choose and no default is provided. A group construct encapsulates the behavior of its subpipeline. It is a convenience wrapper for a collection of components and can be used to perform parameter renaming to aid in reuse of sets of components. A try construct isolates a subpipeline, preventing any errors that arise within it from being exposed to the rest of the pipeline. A try construct begins with two subpipelines: an initial subpipeline and a recovery (or “catch”) subpipeline. In the context of try/catch, “errors” refers to component failure which is not the same as a static or dynamic error in the pipeline itself. (Though perhaps it will be possible to recover from some dynamic errors.) The notion of component failure as a distinct class of error needs to be described. It evaluates the initial subpipeline and, if no errors occur, the results of that pipeline are the results of the construct. However, if any errors occur, it abandons the first subpipeline, discarding any output that it might have generated, and evaluates the recovery subpipeline. In this case, the results of the recovery subpipeline are the results of the try construct. If the recovery subpipeline is evaluated and a component within that subpipeline fails, the try fails. For example, a pipeline might attempt to process a document by dispatching it to some web service. If the web service succeeds, then those results are passed to the rest of the pipeline. However, if the web service cannot be contacted or reports an error, the catch construct can provide some sort of default for the rest of the pipeline. In order to ensure that the result of the try is consistent irrespective of whether the initial subpipeline provides its output or the recovery subpipeline does, both subpipelines must declare the same number of outputs with the same names. It is a static error if the two subpipelines declare different outputs. In order to support corrective action in the recovery subpipeline, components inside it have access to all the error output of the components that were in the initial subpipeline on a special port named “#error”. In evaluating the initial subpipeline, failure of one component can cause other component to fail. In addition, some components that fail might not produce output on their error ports and some components that succeeded might produce such output. This pipeline language places no constraints on the order of error messages provided to the recovery subpipeline, nor does it attempt to guarantee that such output will be available in all cases. The error documents that appear should conform to Appendix C, The Error Vocabulary. A pipeline document may declare additional steps. These can be implementation-defined steps or can be defined through some implementation-dependent extension mechanism. Each declared step must have a name and a signature. It is a static error if a pipeline contains an step that is not recognized by the processor. This section describes a set of XML syntactic elements sufficient to represent all the aspects of a pipeline, as set out in the preceding sections. A pipeline is a flow graph of connected components, some of which may themselves contain flow graphs. Elements in a pipeline document represent the flow graphs, using one element for each component and a combination of elements and attributes to specify how the inputs and outputs of each component are connected, and to represent parameter bindings. Containment is represented naturally using nesting of XML elements. Elements which represent components all have names, the value of the name attribute. These names are used to establish the bindings between inputs and outputs (e.g. we can speak of “the ‘result’ output port of the component named ‘foo’ being connected to the ‘document’ input port of the component named ‘bar’.”). A document or a sequence of documents can be bound to a port in three ways: by source, by URI, or by providing it “here”, as the content of the element establishing the binding. A document must be specified in exactly one of these ways, otherwise a static error is raised. [Definition: A document is specified by URI if it refers to it with a URI.] The href attribute is used for this purpose. In this example, the input to the Identity step named “otherstep” comes from “http://example.com/input.xml”. There are constraints on what ports can be specified, dependent on context. an allowed input, per these three alternatives, for the component's container. If the specification is for the output of a construct, the specified port must be an output port of some component within that construct. Alternative 3 above corresponds to a connection between components in two separate subpipelines, for example from a component in the subpipeline of a pipeline itself to a component in the subpipeline of a for-each. This contradicts the definition of subpipeline as a self-contained flow graph in Section 2.1, “Steps, Constructs, and Subpipelines”. It is the WG's intention to provide for the functionality delivered by such connections, but how this will be accomplished has not yet been decided. In this example, the “document” input to the XInclude step named “expand” comes from the “result” port of the step named “otherstep”. It is a static error if the specified port does not exist. In this example, the “stylesheet” input to the XSLT step named “xform” comes from the content of the p:input element itself. Here documents are considered “quoted”, they are not interpolated or available to the pipeline processor in any way except as documents flowing through the pipeline. The scope of a port name is the component on which it is defined. The names of all input and output ports on any component must be unique. The scope of component names is the flow graph of their container and the flow graphs of the constructs therein, recursively. [Definition: An element from the XProc namespace may have any attribute not from the XProc namespace, provided that the expanded-QName of the attribute has a non-null namespace URI. These attributes are called extension attributes.] The presence of an extension attribute must not cause the flow graph to differ from the flow graph that any other conformant XProc processor might produce. They must not cause the processor to fail to signal an error that a conformant processor is required to signal. This means that an extension attribute must not change the effect of any XProc element except to the extent that the effect is implementation-defined or implementation-dependent. A processor which encounters an extension attribute that it does not recognize must behave as if the attribute was not present. [Definition: Outside the context of a “here document”, any element not in the XProc namespace is an extension element.] The presence of an extension element must not cause the flow graph to differ from the flow graph that any other conformant XProc processor might produce. They must not cause the processor to fail to signal an error that a conformant processor is required to signal. This means that an extension element must not change the effect of any XProc element except to the extent that the effect is implementation-defined or implementation-dependent. Inside the context of a here document, all content is considered quoted so neither extension elements nor XProc elements are said to occur. A processor which encounters an extension element that it does not recognize must behave as if neither the element nor its attributes, nor any of its content was present. This section describes in detail the XML vocabulary that represents a pipeline. A p:pipeline represents a pipeline. Its children declare the inputs, outputs, and parameters that the pipeline exposes and represent its subpipeline. If specified, the name must be unique across all available pipelines. If a p:pipeline occurs as the child of a p:pipeline-library element, it must be named. A pipeline can declare additional steps (e.g., ones that are provided by a particular implementation or in some implementation-defined way) and import steps from libraries. A p:declare-input declares an input port. The port attribute defines the name of the port. It is a static error to define two ports with the same name. An input declaration can indicate if a sequence of documents is allowed to appear on the declared port. If sequence is specified with the value “yes”, then a sequence is allowed. If the sequence is not specified, or has the value “no”, then it is a dynamic error for a sequence of more than one document to appear on the declared port. If a binding is provided, a select expression may also be provided. If provided, the specified XPath select expression is used to filter the document(s) that are read. Each matching node or set of nodes is wrapped in a document and provided to the input port. See Section 4.2.6, “p.input Element”. A p:declare-output identifies an output port. The port attribute defines the name of the port. It is a static error to declare two ports with the same name. An output declaration can indicate if a sequence of documents is allowed to appear on the declared port. If sequence is specified with the value “yes”, then a sequence is allowed. If the sequence is not specified, or has the value “no”, then it is a dynamic error if the component produces a sequence of more than one document on the declared port. It is a static error if more than one binding is specified. A p:declare-parameter declares a parameter. Components must declare the parameters that they accept. The name attribute must be a single asterisk (*), a QName, or a string of the form *:NCName or NCName:*. A “*” in a declared name functions as a wild card, allowing any parameter with a matching name to be specified. If name is a QName, then the declaration may include a default value using either content or a select attribute as per p:param. A p:step represents an step in a pipeline. The type attribute identifies the component to be instantiated. It is a static error if the name is not unique in the current scope, if the specified type is not known to the processor, or if the specified inputs, outputs, and parameters do not match the signature for steps of that type. A p:input identifies input for a component. It is a static error if more than one of source, uri or here document is specified. The port attribute identifies the input port of the component that will read from the specified source. It is a static error if the name given does not match the name of an input port for the component or if more than one input is specified for any given port. provides a sequence of zero or more documents, one for each matching html:div in http://example.org/input.html. provides a sequence of zero or more documents, one for each matching html:div in the document (or each of the documents) that is read from the portname port of the component named origin. A p:param associates a particular value with a parameter. In this case, the (XPath 1.0) string value of the content becomes the value of the parameter. The (XPath 1.0) string value of the result of evaluating the expression becomes the value of the parameter. An p:import-param provides a set of in-scope parameters to a component. All in-scope parameters which match the name are made available to the component as if they had been specified with individual p:param elements. A p:for-each represents a for-each. Exactly one input must be declared and it must include a binding for the port it declares. If outputs are declared, they must also include a binding. The processor will provide each document read through the input binding to the subpipeline represented by the children of the p:for-each, one at a time. For each declared output, the processor will collect all the documents that are produced for that output from all the iterations, in order, into a sequence. The result of the p:for-each is that set of document sequences. Example 2, “A Sample For-Each” shows an example of a p:for-each in action. The //chapters of the DocBook document are selected. Each chapter is transformed into HTML and XSL FO using an XSLT step. The resulting HTML and FO documents are aggregated together and appear on the html and fo ports, respectively, of the chapters construct itself. It is a static error if there is not exactly one p:declare-input child of p:for-each or if the declared input does not specify a binding. It is a static error if any declared output does not specify a binding. A p:viewport represents a viewport. Exactly one input must be declared and it must include both a binding and a select expression. Exactly one output must be declared and it must include a binding. The processor will provide a document that contains each set of nodes that matches the specified select expression through the input binding to the subpipeline represented by the children of the p:viewport, one at a time. What appears on the output from the p:viewport will be a copy of the input document except that where each matching node or set of nodes appears, the result of applying the subpipeline to those nodes will be output. It is a dynamic error if the input source is a sequence of more than one document or if the output from any iteration is a sequence of more than one document. Example 3, “A Sample Viewport” shows an example of a p:viewport in action. The //h:div[@class='enc']s of the document are selected. Each selected div is encrypted and the resulting encrypted version replaces the original div. The result of the whole construct is a copy of the input document with each selected div encrypted. It is a static error if there is not exactly one p:declare-input child and exactly one p:declare-output child of p:viewport or if the declared ports do not specify a binding. A p:choose represents a choose. Each conditional subpipeline is represented by a p:when element. If no context is specified on the p:when, the context specified on the p:choose is used. It is a static error if no context is specified in either place. Note, in particular, that without the p:declare-input, there's no direct way to specify a here document for the context. The test attribute provides the guard expression for the subpipeline. The default branch is represented by a p:otherwise element. All of the p:when branches and the p:otherwise must declare the same number of output ports with the same names. It is a static error if they do not. The result of the p:choose is the result of the selected subpipeline. It is a dynamic error if no p:when is selected and no p:otherwise is specified. A p:group is a wrapper for a subpipeline. The result of a p:group is its declared outputs. A p:try represents a try/catch. Within the p:catch block, the special input port #error is defined. The document(s) on that port constitute the error messages received from the component which failed. Note that the order of the messages on that port is undefined. Note also that the failure of one component can cause others to fail and the component which signaled the error might not be the only or even the first component that failed. Both the p:group and the p:catch must declare the same number of output ports with the same names. It is a static error if they do not. A p:declare-step provides the type and signature of an implementation-dependent type of step. It declares the inputs, outputs, and parameters for all steps of that type. We need to make some provision for identifying the implementation of a declared step, even if it's no more than implementation-defined extension attributes. We'll need some sort of mechanism for declaring multiple implementations too. It is a static error if the type attribute of a p:step is not recognized by the processor. It is not an error to declare such an step, only to use it. Exactly one input declaration of a p:declare-step may use the name “*” to indicate that the step accepts an arbitrary number of inputs. A p:pipeline-library contains one or more step declarations and/or pipelines. It declares steps that pipelines can import. An p:import loads a pipeline or pipeline library, making it available in the current context. An import statement loads the specified URI and makes any pipelines declared within it available to the current pipeline. It is a dynamic error if the URI cannot be retrieved or if, once retrieved, it does not point to a p:pipeline-library or p:pipeline. If it points to a p:pipeline, it is a dynamic error if the pipeline does not have a name. Errors in a pipeline can be divided into two classes: static errors and dynamic errors. [Definition: A static error is one which can be detected before pipeline evaluation is even attempted.] Examples of static errors include cycles, incorrect specification of inputs and outputs, and reference to unknown components. Static errors are fatal and must be detected before any components are evaluated. A [Definition: A dynamic error is one which occurs while a pipeline is being evaluated.] Examples of dynamic errors include references to URIs that cannot be resolved, components which fail, and pipelines that exhaust the capacity of an implementation (such as memory or disk space). If a component fails due to a dynamic error, failure propagates upwards until either a try is encountered or the entire pipeline fails. In other words, outside of a try, component failure causes the entire pipeline to fail. [Infoset] XML Information Set (Second Edition) John Cowan, Richard Tobin, editors. W3C Working Group Note 04 February 2004. [XML 1.0] Extensible Markup Language (XML) 1.0 (Fourth Edition) Tim Bray, Jean Paoli, C. M. Sperberg-McQueen, et. al. editors. W3C Recommendation 16 August 2006. [XML 1.1] Extensible Markup Language (XML) 1.1 (Second Edition) Tim Bray, Jean Paoli, C. M. Sperberg-McQueen, et. al. editors. W3C Recommendation 16 August 2006. Component A is after component B if component B is the container for component A (or an ancestor of such a container) or if any output from component B is connected to any input of component A, either directly or indirectly. Note: defined but never referenced. Component A is before component B if component B is a contained component of component A, either directly or indirectly, or if any output from component A is connected to any input of component B, either directly or indirectly. A document is specified by source if it refers to a specific port on another component. A document is specified by URI if it refers to it with a URI. Components A and B are connected if they are either directly or indirectly connected. Component A is directly connected to B if an output of A is associated with an input port of B. Component A is indirectly connected to B if there is a chain of directly connected components that allows traversal from A to B. A construct is a unit of XML processing that contains additional components. That is, a construct differs from a step in that its semantics are at least partially determined by the components that it contains. The components that occur inside a construct are called contained components. A construct which immediately contains a component is called its container. An element from the XProc namespace may have any attribute not from the XProc namespace, provided that the expanded-QName of the attribute has a non-null namespace URI. These attributes are called extension attributes. Outside the context of a “here document”, any element not in the XProc namespace is an extension element. The components contained in a pipeline or other container are the nodes of a flow graph. The input and output ports of the components are connected by arcs in that graph. An document is specified by here document if it is contained in the body of the element that binds it. A component matches its signature if and only if it specifies an input for each declared input and it specifies no inputs that are not declared; it specifies no outputs that are not declared; it specifies a parameter for each parameter that is declared to be required; and it specifies no parameters that are not declared. A parameter is a QName/value pair. A pipeline is an acyclic, directed graph of components connected together by inputs and outputs. The signature of a component is the set of inputs, outputs, and parameters that it is declared to accept. A static error is one which can be detected before pipeline evaluation is even attempted. A step is an atomic unit of XML processing, such as XInclude or transformation. The flow graph of components immediately contained within a construct forms a subpipeline. This appendix describes the XML vocabulary that components are expected to use to identify messages on their error ports. This appendix describes the standard components that must be supported by any conforming processor.